Veeam v8 Update 2 – vSphere 6 and Endpoint Support! Veeam Availability Suite Update 2: vSphere 6 Support, Endpoint and More! Today is a key milestone for Veeam Availability Suite v8 (a combination of Veeam Backup & Replication and Veeam ONE) as Update 2 is now generally available. Both products have been updated, and in this blog I’ll showcase what you need to know about the most important features: FULL vSphere 6 Support, Veeam ONE updates and Veeam Endpoint Backup FREE Support. 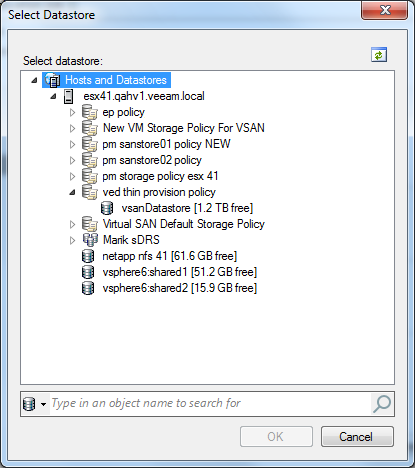 Veeam FULLY supports vSphere 6! When I last wrote how vSphere 6 Support is coming soon, we wanted to proactively communicate that support was coming. Since then, our QC has been busy performing our standard extended stress testing of the release candidate builds against vSphere 6 RTM code – and today we are finally making the Update 2 generally available. Let’s look into this list a little closer. 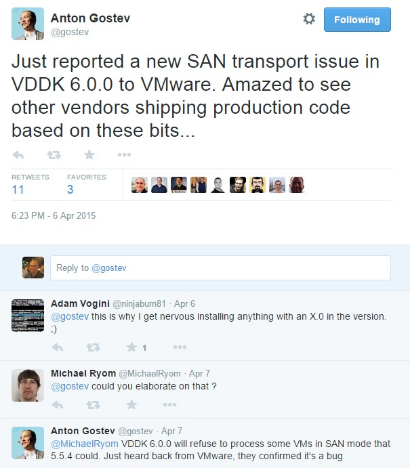 While support for VVols, VMware Virtual SAN 2.0 and Hot-Add transport mode of SATA virtual disks comes easy by simply using the new Virtual Disk Development Kit (VDDK) version, it’s still important to note that our Virtual SAN support remains very advanced on the market as Luca describes. Keep in mind that this smart processing mode provides the most efficient availability technology for any EVO:RAIL and EVO:RACK solutions, as they are built on VMware Virtual SAN. Just put a virtual Veeam proxy on each host. Storage Policy-Based Management restores ensure the restored VM gets the same policy, or a new one, it had before the backup. The most intriguing part of our vSphere 6 support to me is having the ability now to backup Fault Tolerant VMs with Veeam Backup & Replication. Among many other enhancements to Fault Tolerance, vSphere 6 includes the ability to snapshot Fault Tolerant VMs through APIs (and this is actually the only way that a snapshot can be created on this type of VM). And thanks to that, Veeam Backup & Replication can finally backup and replicate your Fault Tolerant VMs – just like any other VMs. This, along with other Fault Tolerance enhancements in vSphere 6 removes the remaining barriers of using Fault Tolerance in your data center, providing truly the ultimate in availability for your modern data center. vSphere 6 also provides new APIs for programmatic access and management of vSphere tags. Tags are really a great way to set backup policies when the infrastructure is mixed and combined for resource optimization. We’ve had support for vSphere 5 tags already (of course, Luca blogged that too) and with our vSphere 6 tag support, you can continue building advanced backup policies around this very flexible infrastructure-centric framework even after you upgrade. Another key feature that we have support for in vSphere 6 is cross-vCenter vMotion. While Veeam Backup & Replication supported protecting VMs across multiple vCenter Server systems for as long as I remember, the problem this new VMware functionality solves is jobs “losing” explicitly added VMs after they move to another vCenter, where their unique object ID (moRef) will be changed. With added support for cross-vCenter vMotion in our Quick Migration functionality, when migrating a VM to another vCenter Server, the associated entries on backup or replication jobs will be updated automatically, so the availability requirements continue to be met. The final support for vSphere 6 point I want to cover is the ability to do Quick Migration tasks to a VVol. Quick Migration is still a part of Veeam Backup Free Edition, and is a great way to move VMs around when using vMotion is not an option, including instances when you have an unreliable or slow network links, in scenarios when vMotion is not supported, or even due to something as simple as the lack of the corresponding VMware license. This functionality can help to perform full migrations to new clusters built from the ground up with the latest vSphere 6 features and not inherit any design problems from previous clusters. Gostev tells it like it is. One other thing that is important to note is that while adding vSphere 6 support, we keep support for prior versions of vSphere, which are fairly widely used and still supported by VMware. As such, vSphere 4.0 and newer remain supported with Update 2. Again citing the Veeam Forums; we are very transparent with our customers about our plans for platform support as well as your plans. Did you see the forum poll earlier this year about which version you plan to be on by the end of 2015? This goes directly to the R&D team to help prioritize features and platform support based directly on your feedback. And while the bulk of the respondents (45% as of the time of this blogpost) plan to be on vSphere 6 by the end of 2015, as shown below – we can’t drop the ball on those users who chose to stay on the last “fat” ESX version due to their requirements. 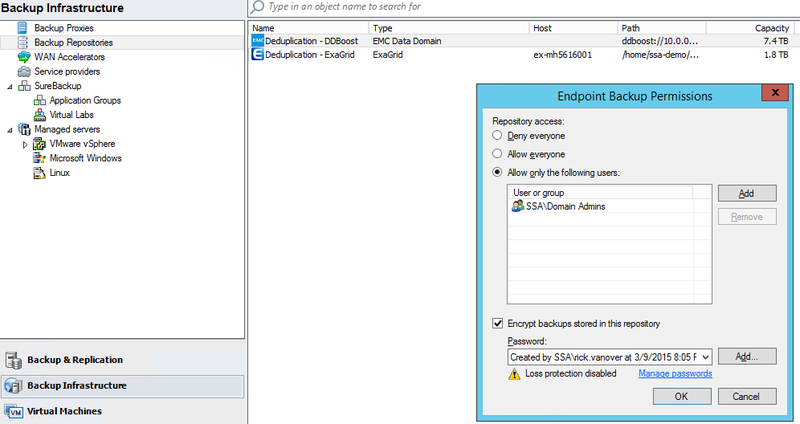 Support for Veeam Endpoint Backup FREE! Without a doubt, one of the more exciting new products we’ve had recently is Veeam Endpoint Backup FREE. With Update 2 we now have the ability to see backups inside of a Veeam Backup & Replication console. Additionally, and personally most intriguing, we can put endpoint backups in Veeam repositories. This is excellent news for organizations who have critical endpoint devices or a few remaining non-virtualized systems in the data center. Endpoint support also includes exporting backed up physical disk contents into various virtual disk formats, performing files and application item restores, as well as using Backup Copy and Backup to Tape jobs for shipping endpoint backups offsite. All paid editions of Backup & Replication will be able to receive Endpoint backups with Update 2. If you haven’t given Endpoint Backup FREE a look yet, I highly encourage you to do so. Endpoint backup should be simple and FREE, and Veeam Endpoint Backup FREE is not one to disappoint. Also available now is Veeam ONE Update 2, which brings in important settings as well. In discussions with Vitaliy Safarov, Product Manager for Veeam ONE, I asked him what his favorite feature is for this update. His choice is the support to monitor everything in vSphere 6, including VVols. Having the complete visibility for the new features of vSphere 6 are very important; as you can’t run a critical technology without having the visibility you need to support it. Veeam ONE can let you run this new storage practice with the visibility you need to ensure there are no surprises along the way. Recorded Webinar: Veeam Availability Suite v8 Update 2: FULL vSphere 6 support and More!